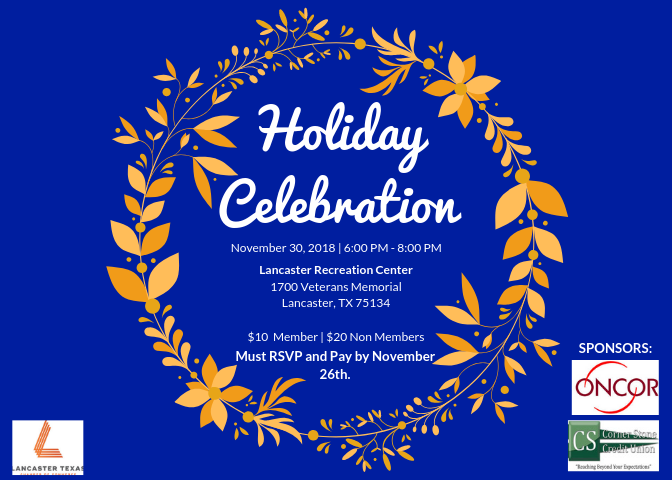 Holiday Celebration and Member Appreciation (members, please keep a look out for a special invitation with your ChamberMaster login information). Event is "come and go" and will be held on November 30th from 6:00 PM to 8:00 PM at the Lancaster Recreation Center. Appetizers will be served. Come and enjoy the fun, food and music. Awards will be presented at 7:00 PM. Must RSVP and pay by November 26th. For more information you may go to www.lancasterchambertx.org or by calling 972-227-2579.